We've been in Texas for 2 weeks now and have been enjoying our, albeit very busy time, with friends and family. Here are a few pictures. 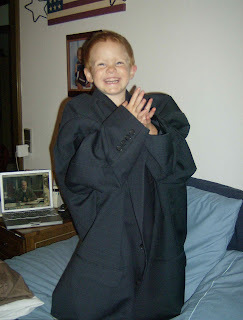 Nathan said, "I'm Dad" after trying on his suit. He's so much fun. The 2nd picture tells you how we all felt the first few days back. 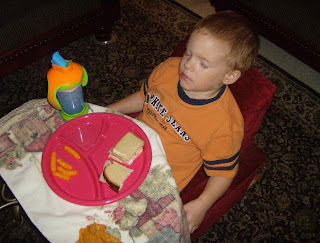 Nathan had asked for lunch and Danny was in the kitchen making it when he came back to the living room....he found Nate out for the rest of the afternoon! Both of the boys have done well, considering what we've put them thru since arriving. We've seen our home church and put the boys in the nurseries/Sunday school, had family love on them, help plan a wedding for Danny's sister, be IN the wedding and the next day we drove to Austin, Texas, to report to another church--which meant another Sunday school class/nursery. But Nathan & Micah are troopers. They give us so much joy too! Just last night we were out to a late supper with Papa and Grama (or GG as Nathan calls her --GreatGrandma=GG) and the adults ordered Chocolate shakes and Nathan stood in his chair leaned over the table and whispered to the waitress, "I want one too". It was soooooo funny & adorable.